It’s been almost five years now since Blue Ocean Robata & Sushi elevated the restaurant scene in Carlsbad with their innovative mix of Japanese Robata, sushi and a fabulous cocktail lounge. Since then they have opened a poke joint next door called Pokewan and their latest venture is nestled between the two, an intimate, 25-seat space in a renovated outdoor patio called Harumama. I would like to report that prior to my meal at Harumama, I met my friend at the Blue Ocean bar that is still bustling and the restaurant was packed on a Wednesday night. 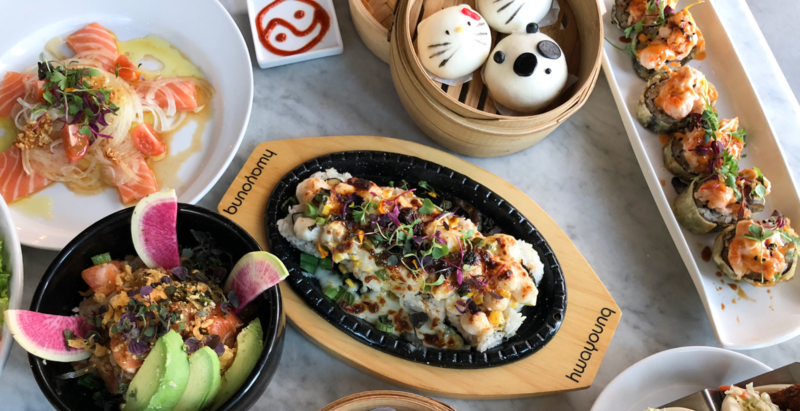 The first Harumama opened to big crowds earlier this year in Little Italy from local restaurateurs Jenny and James Pyo, who run Love Boat Sushi and seem to be on a bit of roll with new, successful concepts opening on a regular basis. They describe Harumama as “comfort food meets culinary innovation” and well, nice job whoever came up with that one as it pretty much nails it. If you are not familiar with the adorable, (yes, I called them adorable) steamed buns they are quite the rage and actually delicious. Guys, just put your manly egos aside when embarking on a trip to Harumama as these are very tasty and there are plenty of other options on the menu. The buns feature cartoon-y characters like pandas, pigs and Haru Kitty and are filled with pork, BBQ beef, chicken, purple potato and Nutella as a fun dessert option. It should be noted that the steamed buns come two per order, are made fresh daily, and are based on seasonal ingredients so they may mix them up a bit. 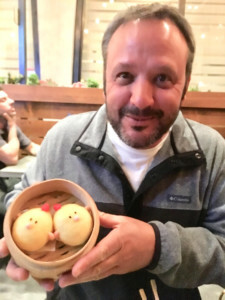 On a similar topic, their Bao Bao Buns are the open, or taco-shaped version of the steamed buns and while not quite as cute, they have some very nice options to fill them with. Pork belly, crunchy shrimp, duck, pulled chicken, Karaage chicken and fried eggplant all are options and they also come two to a serving. Cuteness aside, both the steamed buns and Bao Bao buns are somewhat addictive, especially when there is any type of munchies going on. I could eat about a dozen of each with a good hunger going. OK, maybe a slight exaggeration but you get my point. We started our meal with a simple Seaweed Salad with wakame seaweed, sesame seed and ponzu along with a Cucumber Noodle Salad with mango habanero dressing, edamame, watermelon radish, tomato and micro shiso. Both were light, flavorful and the perfect way to start a meal. There is also a nice selection of bowls and being the Katsu freak that I am, we split the Crispy Chicken Katsu bowl. It was a beauty of a bowl with panko-breaded cutlet over rice, caramelized onions and pickled cucumber. Most Katsu I’ve had in the past has come Hawaiian plate lunch style, but I loved this presentation and the ability to mix up all the components of the bowl. Other bowls include Teriyaki Salmon, Spicy Tuna and Spicy Sesame Salmon. And of course given their proximity next door to Blue Ocean Robata & Sushi they offer a couple sushi roll options. The Heart Attack, which is listed as “spicy,” comes with tuna, shrimp, jalapeno and cream cheese topped with chef blend of black sesame seed and no rice on this one, as it’s deep-fried. The Rice Crunch Spicy Tuna is another interesting mix of rice crunch, spicy tuna, mango mascarpone puree and chipotle adobo. Not necessarily my cup of tea but there you have it. There are seven options in the Ramen and Noodle section as that category is almost a requirement in an Asian eatery these days. And given the cool weather of late that’s a good thing. Harumama puts their unique spin on both with broth that is made fresh daily and proteins that include duck, chicken, pork and a veggie option. As of this writing, alcohol was not available yet but it’s coming soon and they do have some really nice beverage options that go well with the food. My suggestion would be to hit up the bar at Blue Ocean for a couple cocktails prior to your dinner next door. It’s a busy joint so be prepared for a short wait but the tables do seem to turn quickly. Any way you choose to do it, check this place out. It will put a smile on your face and happy in your belly. 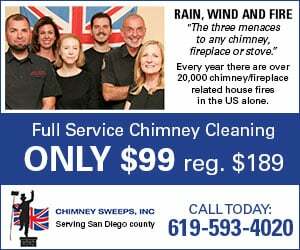 Find them at 2958 Madison St. Carlsbad. Call (760) 720-7874 or visit www.harumamasd.com.